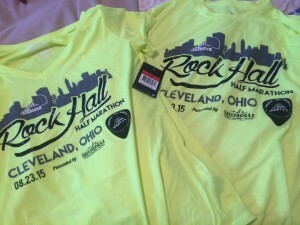 We have full coverage of the inaugural Rock Hall Half Marathon weekend of events. You can also check out our YouTube video and photo gallery on our Facebook page. We will also be bringing you coverage of the inaugural 5k event and a story of one young Casual Runner who took on his first ever 5k event! You can also check out Mike’s results in his latest attempt to chase the rabbit in this race. To be honest, I have not had much luck with Cleveland races. I will save you the details, but when I saw this race in its debut year, I had to see what it was all about. 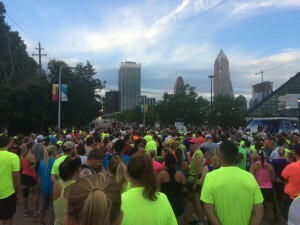 Casual Runners ready to rock Cleveland in the inaugural Rock Hall Half Marathon. I had no idea what to expect going into this race as I had just run the inaugural Goodyear Half Marathon in Akron the previous Saturday. While I did not have the best week of training/recovery in between, I never doubted that my conditioning was where it should be for a half marathon. The only question would be whether I would chase the rabbit and go for a PR. Well, you’ll have to wait for a future article to hear all about that. (Man, I really am a meanie sometimes, aren’t I?). Packet pickup was great. The event provided free parking a short walk from the Hall of Fame. Vendors were set up outside on the welcome plaza and the weather was perfect, which made for an enjoyable and easy experience. The one hiccup was, when we went into the Hall of Fame itself, it was not intuitive where to go to pick up our packets. We saw some other runners and asked them, and they directed us down the escalators. Runners really are the friendliest people. Pickup was quick and efficient. We gave the volunteers our names and they assigned us bib numbers (they were not preassigned, which I actually kind of liked because it sped up the process). They allowed us to pick up the bibs for my brother and nephew who were running the 5k event (again, keep an eye out for a feature article on this!). And then we were off to enjoy the Hall of Fame. The event shirts were nice Nike tech shirts bearing the event logo. They were a little thinner than you usually get at races, but it’s a nice weight for hot summers. Also, they are a bright yellow color, so if you wear it while running, you will definitely be visible. Event shirts. Not shown: free admission to the greatest collection collection of Rock and Roll memorabilia. The big winner of the swag however was the free admission to the Rock and Roll Hall of Fame and Museum that came with our half marathon entries. Enjoy a day checking out the greatest collection of Rock memorabilia under one roof? I don’t mind if I do! Check out our event video for some of the great sites from inside the Museum. Of course I sported my Team Casual Runner running singlet, you have to represent, right? The rest of my race kit consisted of Layer 8 running shorts, Adidas Climalite compression shorts, Steigen running socks, a Sweatvac hat, Sqoosh sport bands, Soleus GPS+ watch, and Saucony Virrata running shoes. I also had my Iphone 5S, Yurbud Ironman Series headphones, and a Ziploc bag for moisture protection. Finally, since I knew I would be sweating a lot, I applied – TMI alert – two Band-Aids and a generous amount of Body Glide to prevent chafing. Yes, folks, runners do share these things! Race morning went smoothly. We spent the night at my brother’s house which meant I only had to leave about an hour before the gun time. There was no traffic at this time of morning and we quickly found our way from the highway to the entrance of a nearby parking lot. The only hitch was the parking attendant did not have change, which slowed the parking process as we all dug through our emergency french fry change to come up with the parking fee (runners do have to be prepared for everything). It was a short walk to the starting area, where runners were gathered and music was playing. It was a fun atmosphere and the weather could not have been more perfect. The 7:15 start was a nice change from the usual pre-dawn start times. I don’t know why, but I felt like the start of the race snuck up on me. We heard the announcement that the race would begin “shortly,” but could have used a 1 minute or 30 second warning. In either event, I quickly composed myself and set off. 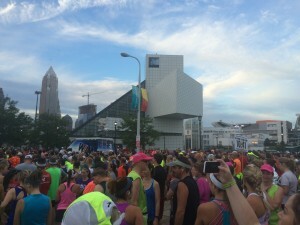 Casual Runners gather outside of the iconic Rock and Roll Hall of Fame and Museum in Cleveland, Ohio. The course began with a slight uphill as we climbed toward downtown, and then took an immediate right hand turn. Race Icon. This took us along the plaza in front of the Rock and Roll Hall of Fame and Museum, which was gorgeous in the first light of morning. We proceeded past the Great Lakes Science Center and then to First Energy Stadium (homer alert! ), home of the greatest NFL franchise ever, the Cleveland Browns. Once past the stadium we took a sharp left and started another (not huge) climb into downtown Cleveland, where we made our way past the courthouses, the new convention center, and eventually onto the campus of Cleveland State University. As you can tell, the first 2 miles were packed with entertaining sights, though there were not too many spectators. After the 2.5 mile mark we turned left onto what turned into a long, flat straightaway lasting more than 3 miles. Some would call this an easy stretch, others might call it boring. Whatever your pleasure, it certainly is a necessary course feature as it was the most direct route to take us to what I believe was the highlight of the course. Through most of course, crowd support was sporadic, but it was nearly non-existent on this stretch. It was at this point that I was glad that I wore a hat. We ran straight into the early morning sun and I was able to pull the brim down to shield my eyes and mop up some of the sweat. We entered the campus of the Cleveland Clinic and then turned left into University Circle. The weirdest part about this stretch was a random wig of long black hair that I almost tripped over as it was laying right in the middle of the street. Remember, runners do have to be prepared for anything, and I mean anything. Now, if you are looking for a reason to run this race, this is it. Race Icon. This stretch may be one of the most enjoyable 3+ mile stretches I have ever run, let alone raced. Starting in University Circle, we enjoyed a consistent downhill run through gorgeous tree-lined parkland, picturesque stone arch bridges, and the Cultural Gardens, where volunteers were setting up stands for a festival later that day. To a person, every runner I spoke with thoroughly loved this stretch of the course. As an added bonus, the downhill feature helped everyone tremendously with their splits. We made our way towards the lakefront and turned left onto the bike path. I must say, the Cleveland Police Department did a great job of closing the course and ensuring the safety of the runners. They were also incredibly friendly and supportive along the course. When we reached the lakefront paths, we were more on our own as there were no major road crossings. The problem we encountered here were with weekend boaters trying to enter the various yacht clubs who grew annoyed at having to wait for a break in the action. I saw one driver pass a maintenance vehicle (we were in the right lane of a 2 lane road, she was coming the opposite direction in the left lane, and entered our lane to pass), but she was texting the entire time and look at her phone. I yelled out to her and was quickly joined by other runners. Fortunately she looked up and moved back over, but it just goes to show that, even if you are on a closed course, you have to be on the lookout for vehicles. Now, this stretch along the lake was, well, long. 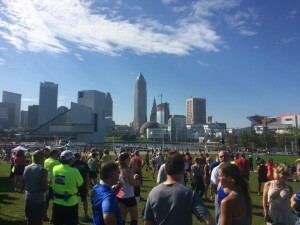 It was nice to take in the views of Lake Erie and the downtown skyline in the distance, but it just seemed to drag on as we stared at First Energy Stadium (just beyond the finish line) for 3 miles….3 LONG tantalizing miles! You just had to dig in and force yourself to keep going. The good news is this stretch was flat, so really it is just you against yourself to keep going. Some runners prevailed, others did not, but we did our best to encourage one another. Once past Burke Lakefront Airport we had one last short climb, and then a sharp right into a downhill towards the finish at the Ninth Street Pier. There were plenty of spectators and blaring music, which helped add a little pep to my step as I cruised towards the finish. An enjoyable way to end a successful and fun race. For an inaugural event, organizers brought their game in designing the first SMO. 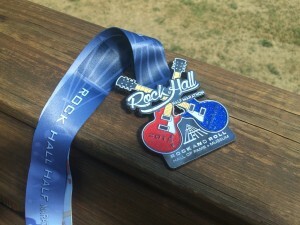 The finisher medal features crisscrossed guitars above the Rock and Roll Hall of Fame and Museum logo. It is both sparkly and has a bit of a rough feature to the finish, which is very much in fashion for Rock and Roll. Thumbs up to the design aesthetics. A fitting SMO to remind everyone that Cleveland rocks! The ribbon is a nice custom design featuring more guitars, the host city, and a depiction of the Hall of Fame itself. Not going to lie, the only thing that could have made this better is if they would have given us guitars to smash at the finish. Maybe next year…maybe? Yeah, probably not. Organizers set up a post-race festival along the lakefront. Again, they could not have ordered up a more picture perfect day for this race. Volunteers were plentiful and on their game. I was exhausted, and not one, but 2 separate medical personnel asked me if I was ok as I crossed the finish line (did I really look THAT bad?). No worries, I felt great. Casual Runners soaking in a perfect summer morning on the North Shore of Ohio with the Cleveland skyline in the distance. I received a few bottles of water, which I quickly downed, and met up with my running buddies and my family. We took pictures and made our way over to the finisher’s area where my nephews reveled in the abundance of ice cream sandwiches, pizza, freezer pops, and…yeah, organizers brought their game went it came to post-race refreshments. The musical selection was great without being overwhelming. All of this added up to a very enjoyable post-race experience. Since this race is all about Rock and Roll, I did have to make sure that I gave myself an appropriate soundtrack to enjoy while out on the course. I won’t run through them all, but my favorite additions by far were: Demons (Imagine Dragons), Don’t Stop Me Now (Queen), and Geronimo (Sheppard). Oh, and I brought back some good ones from past playlists such as Roar by Katie Perry. My music was, at least for me and my eclectic tastes, sufficiently rocked out for this event. Would I run this race again? Yup. For sure. Ok, so the 2, 3 mile or so stretches of flat were not the most exciting I have ever run, but they were necessary design elements to give us the start/finish at the Hall of Fame and the amazing portion through University Circle and the Cultural Gardens. Plus, while crowd support was not great, it was an inaugural event. That being said, this is a very good event with a committed team of organizers, and so I hope the community will embrace and support it more going forward. Plus it is a course that is designed to set (or crush) PRs, but you have to check out this article to read all about it! We have full coverage of the inaugural Rock Hall Half Marathon weekend of events. You can also check out our YouTube video and photo gallery on our Facebook page. We will also be bringing you coverage of the inaugural 5k event and a story of one young Casual Runner who took on his first ever 5k event!